Happy 1 Year Blogversary! I can't believe it's been a year since I decided to face my fear of the kitchen. Big thank you to everyone who has listened to me talk about the blog, people I made join the blog & those who have sent me recipes to try. And the biggest shout out goes to J for being so supportive and always complimenting my meals...even when we both know they shouldn't be given compliments. It is only appropriate to start out this next year with a fun & tasty treat! My office was having another baked goods potluck (no prizes this time :( ) for Valentines Day, so what better opportunity to try out this fun and appropriate looking recipe. 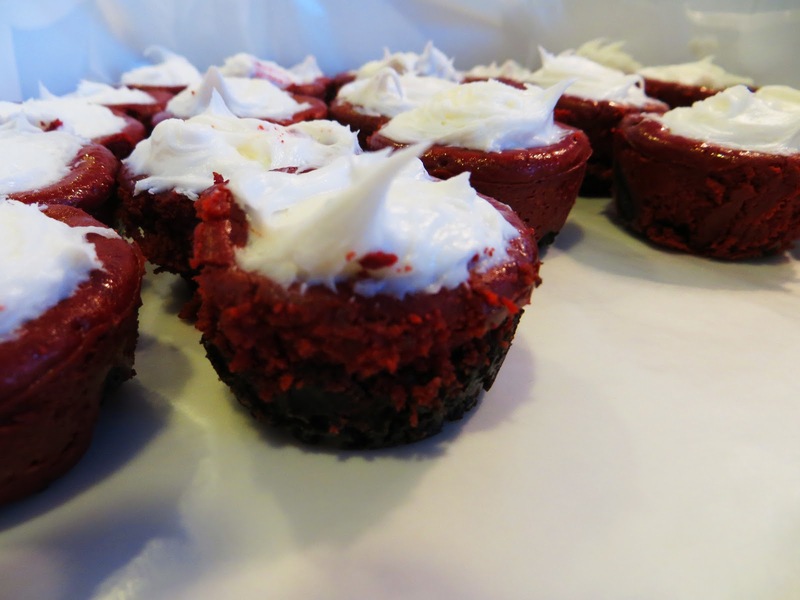 If you've been reading my posts, it's pretty clear I love Cheesecake, and WHO doesn't love Red Velvet?! And did I mention the crust is OREOS??? They are just AMAZING. I made 45 of them and it was not enough! The recipe is quite rich, so making bite sized versions was perfect. I'd be lying though if I said I only ate one. I also cheated on the frosting. The recipe from Baked by Rachel has a recipe for a whipped topping, but I was too lazy & bought a container of frosting. It was still just as good! How difficult was this for Rachel? Not too hard! In a food processor (or large bowl) blend/mash cookies until only small pieces remain. Stir in butter in completely mixed in. In a greased mini-muffin tin, scoop 1 tbsp of cookie mix. Using the bottom of a flat sided object like a shot glass, press down to flatten cookie in the tin. Bake for 5 mins. Remove from heat & set aside. Add cocoa powder mixing on low until combined. Add vanilla & red food coloring followed by egg. 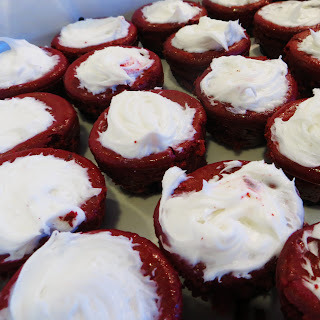 Fill each tin with cheesecake filling leaving a little room at the top. Remove & let cool for 10 mins then fridge for 1 hour. Remove bits from tin & add frosting.